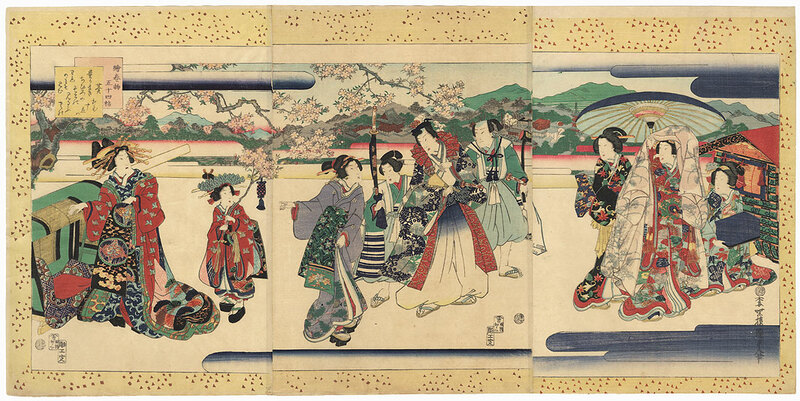 Prince Genji on a Cherry Blossom Viewing Outing, 1869 - Charming triptych depicting Prince Genji and his companions on an outing to view the blossoming cherry trees. 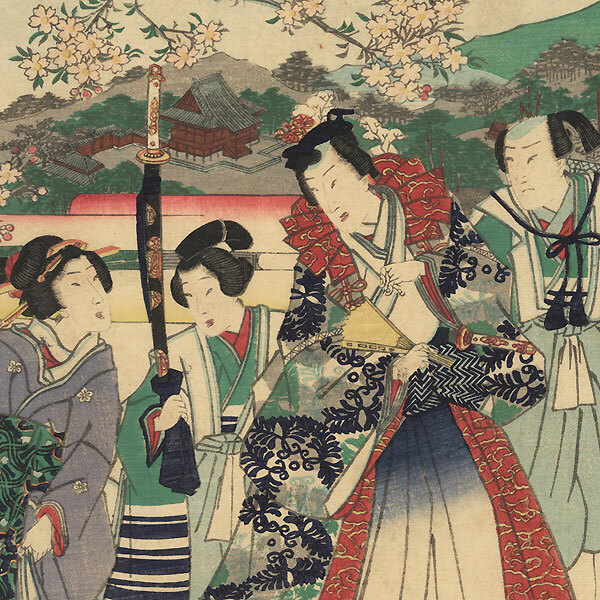 The young nobleman stands in the center wearing a coat with a red pleated collar, smiling as he chats with a beauty that gestures towards the courtesan standing beside a palanquin at left. Her kamuro or child apprentice wears a matching red kimono patterned with plovers in flight, and carries a flowering branch over her shoulder. 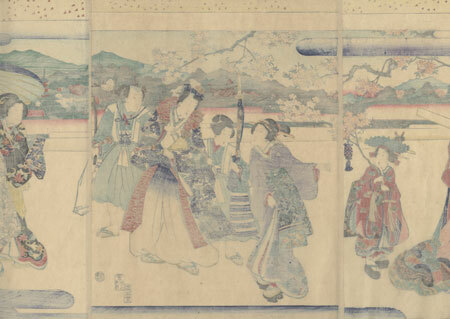 At right, a beauty looks up from beneath a pink robe with a design of grasses and leaves in gray silhouette, an attendant sheltering her with an umbrella. Softly shaded clouds frame the scene along with a yellow border scattered with confetti-like shapes. A lovely design, beautifully detailed with delicate cloth embossing on the pink robe and across the white ground. Condition - This print with excellent detail as shown. Three attached panels. Small tear at edge, small hole, repaired. Slight creasing, a few small marks. Please note: due to the size, this print may be shipped rolled. Please see photos for details. Good overall.